Hector Hugh Munro (Dec 18, 1870 - Nov 14, 1916) was a witty British author who published under the pen name SAKI or H.H. Munro. 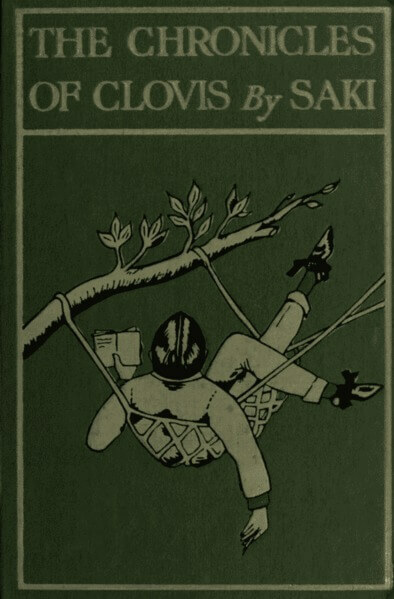 The inspiration for the pen name "Saki" is unknown, it may be based upon a character in a poem or on a South American monkey. Given Munro's intellect, wit, and mischevious nature it's possible it was based on both simultaneously. 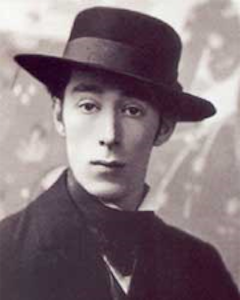 As a writer, Munro (Saki) was a master of the short story form and is often compared to O. Henry and Dorothy Parker. E.F. Benson shares his sardonic style. Munro was born in Akyab, Burma (now known as Myanmar) in 1870. In 1872 while she was on a trip to England, his mother Mary was charged by a cow. She suffered a miscarriage, never recovered, and died in 1872 when Munro was only two years old. After her death, the Munro children were sent from Burma back to England where they lived with their grandmother and aunts in a strict puritanical household. In his early career, Munro became a police officer in India and was posted to Burma where he contracted malaria before returning to England in 1895. When the war broke out, Munro refused a commission joined the British armed forces as a regular trooper where he was certain to see battle. He was killed in action by a German sniper. His last words were reported as, "Put that bloody cigarette out!" In one of those unfortunate twists of fate, the papers that Munro had left behind were destroyed by his sister Ethel, who wrote her own account of their childhood. Munro never married and may have been gay, but homosexuality was a crime in Britain during Munro's lifetime and the decorum of the times would have required him to keep that part of his life secreted away. Munro had a penchant for mocking the popular customs and manners of Edwardian England. He often did so by depicting characters in a setting and manner that would contrast their behavior with that of the natural world; often demonstrating that the simple and straightforward rules of nature would always trump the vanities of men. This is demonstrated gently in The Toys of Peace where parents from Edwardian England are taught a lesson that is still familiar to modern parents. He demonstrates it with striking clarity in The Interlopers and The Open Window, both of which we recommend as two of his best stories. Munro died in France during World War I, on November 13, 1916, by German sniper fire during the Battle of Ancre. Though he was too old to enlist at 43, he had managed to gain a post in the 22nd Battalion of the Royal Fusilliers, where he was a lance-sergeant. According to several sources, his last words were "Put that bloody cigarette out!" We feature his futuristic novel about German-occupied London, When William Came in World War I Literature.